As an avid cyclist, Greg Bullock has ridden thousands of miles per year, nearly every year since 1970. In some years he has logged upwards of 10,000 miles. He has ridden hundreds of "centuries", rides over 100 miles. He rode from New Jersey to Ontario, Canada, saw Niagra Falls, and rode back in under two weeks. During the summers of 2002 and 2003 he had been riding 400 miles per week. Then in 2005, a new baby, a new house, and a new business gave him the perfect excuse to give the bike a rest. Having had a heart issue in 2007, after not riding for a two year period, Greg began to ride in earnest once again. He trained hard to get back to the conditioning of his past. Within six months of having a stent implant, he rode the first of three Livestrong Challenge-Philly rides, of 100 miles, including over 9000 feet of climbing. In the year after the third of his Livestrong rides, having trained for thousands of miles, his knees began to fail. Years of knee problems including surgerys in 1976 and 1981 had taken their toll. Greg managed one more major accomplishment in July 2010, doing the Mt. Ascutney Hill Climb in Vermont, which climbs 2300 feet in just 3.7 miles, averaging 12%, Ascutney boasts sections of more than 20% grade. By September, once again, Greg was off the bike. By April of 2011, Greg struggled to walk, navigate stairs, and could not stand for long periods without sitting to take weight off his knees. Cycling was out of the question. In April 2012, Greg visited Dr. Roy Mittman, of Seaview Orthopeadic Assoc., and the process began. Dr. Mittman diagnosed Greg with osteoarthritis of the knees. A bilateral knee replacement was proposed for treatment. On July 2, 2012 the procedure was completed, replacing worn out knee joints with two total knee replacements! On July 3, 2012, Greg began rehabilitation to work his way back onto the bike. By mid-August, Greg rode the stationary bike in his living room. On Labor Day of 2012, Greg rode 7 miles out on the road. By mid October, he was riding 10 - 15 mile rides on the road three times a week. By late March 0f 2013 Greg was riding 20 mile rides, five days per week. By June, he was riding 30 - 50 mile rides, with several 70 miles rides completed, riding about 150 miles per week. In August 2013, Greg was logging 200 miles per week. From July 2013 through July 2014 Greg rode over 7,000 miles and climbed more than 300,000' on his bike. In August 2014 Greg became the first person known to have climbed Mt. Washington by bicycle with double knee replacements. Through the stages of riding to recover his conditioning, it had become apparent that what Greg is doing as a bilateral knee replacement patient, may be something out of the ordinary. Possibly extraordinary. Greg will continue to push the envelope and hopefully inspire others along the road to recovery, to set goals, to make the effort and feel the sense of accomplishment. Put the metal to the pedal!! Cresting Mt. Ascutney, July 2010, pre knee replacements. 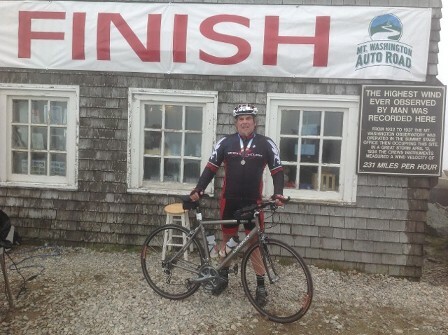 Greg at the finish line of the 2014 Mt. 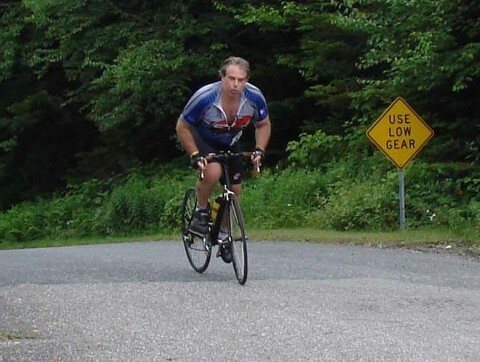 Washington Auto Road Bicycle Hill Climb ... the first person to summit "The Rock Pile" by bicycle with bi-lateral knee replacments.